A force acting for progress. The horse is the force of tapasya that gallops to the summits of the spiritual realisation. 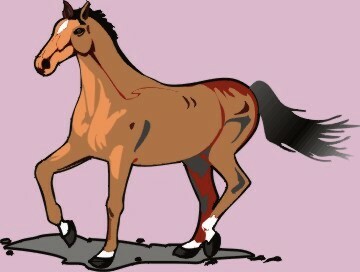 The horse is Power, usually Life-Power, but also it may mean Mind-Power or Tapas if it is dynamic and mobile. The horse was one of the favourite symbols of the Rishis, and a more easily adaptable one, since its force and energy were quite evident. Dark horse means a horse whose qualities are unknown whether it is good or bad, will win the race or lose it — an obscure and unknown factor. When I spoke of being faithful to the light of the soul and the divine Call, I was not referring to anything in the past or to any lapse on your part. I was simply affirming the great need in all crises and attacks, — to refuse to listen to any suggestions, impulses, lures and to oppose to them all the call of the Truth, the imperative beckoning of the Light. In all doubt and depression, to say, "I belong to the Divine, I cannot fail"; to all suggestions of impurity and unfitness, to reply," I am a child of Immortality chosen by the Divine; I have but to be true to myself and to Him -- the victory is sure; even if I fell, I would rise again"; to all impulses to depart and serve some smaller ideal, to reply, "This is the greatest, this is the Truth that alone can satisfy the soul within me; I will endure though all tests and tribulations to the very end of the divine journey". This is what I mean by faithfulness to the Light and the Call.